So DKSH Malaysia just launched Batiste dry shampoo, offering Malaysians the fastest and easiest way to great looking hair (and yes, by great, I mean 'flippable' worthy hair). Launched exclusively at Guardian, Batiste is a classic dry shampoo that instantly refreshes your hair between washes, leaving it clean, fresh and full of body and texture. Another way to look at dry shampoo would be that its body spray, but for your hair. It's inspired by London's fashion style, Batiste has brought up hair styling to a whole new level. Did you know that Batiste has been UK's number one dry shampoo brand for over 30 years? I know, I'm shocked too, but it is what it is. Batiste uses an innovative starch-based formulation that does not leave any residue while eliminating oil and grease from the roots giving it a much-needed makeover in a quick spray to revitalize your hair in less than 5 minutes. Batiste dry shampoo comes in 5 varieties that refreshes your hair with a burst of fragrance, namely Floral & Flirty Blush, Fruity & Cheeky Cherry, Clean & Classic Original, A hint of color divine dark, and Show Stopping Heavenly Volume. Floral & Flirty Blush, Fruity & Cheeky Cherry, and Clean & Classic Original are suitable for everyday use, while the A hint of color divine dark would add light tints of a brownish shade while Show Stopping Heavenly Volume is a 2 in 1 that adds a little more volume than the normal dry shampoos. I've heard of chocolate Fondue before, but this happens to be my first time hearing about Lip Fondue by Mentholatum. *Adds shocked face here*. From the packaging itself, it claims to be a 3-in-1 Lip Fondue that gives your 3-in-1 benefits in one single stick. It's crazy how with just a glide you can now transform dull-looking lips into gorgeous, moisture-looking ones with a natural shine. I FEEL LIKE IM IN THE FUTURE. Screw those typical lip balms, and say hello to these lip balms of the future. The Mentholatum all-new Lip Fondue by Mentholatum which launched in September last year comes in two variants, namely the Aurora 3D Pearl Lip Fondue and the Cassis Rose Lip Fondue which both provides your lips with the 3-in-1 function as a lip essence, lip balm, and lip gloss/mask. The Lip Fondue is enriched with Royal Jelly extract, Honey, and Olive Oil that deeply penetrates into the skin layers of your lips to replenish moisture for a firmer appearance making it the perfect lip essence. And not to forget that it still functions as a lip balm, by providing lips with intense and long-lasting moisture too! It even comes with a seal! And im assuming that the Japanese words are warning to not turn too much. But honestly, I think what makes this the ideal lip fondue would be because it's formulated and enhanced with 3D particles, featuring the Aurora 3D Pearl Lip Fondue that can be served as a "lip gloss". The 3D pearl is twinkling in response to the light to produce more 3-dimensional lips. The Cassis Rose Lip Fondue, on the other hand, can be used as an overnight "leave-on mask" to help moisturize and nourish your lip while keeping it hydrated throughout the night making it the perfect beauty remedy for those who love wearing matte liquids on your lips. This is me wearing the Cassie Rose // Super moisturizing too! Both the Lip Fondue variants also come with sun protection formula that helps protect the lips from UV rays too. I also found out a cool feature on it too! It has been specially designed with dial lock tubes to allow an easy control of the lip balm at all times, and that's by far my first time seeing such a cool intervention (told you that it's the lip balm of the future). Hehe. Alternatively, you can also apply it on bare lips or on top of your lipstick, and if you're trying to optimize the results, it would be recommended to apply 2-3 layers onto lips when needed. Today i'll be sharing with you the benefits of shopping on ezbuy. If youre an online shopper addict (like me, raises hands, guilty), well you'd go crazy once you find out about ezbuy. 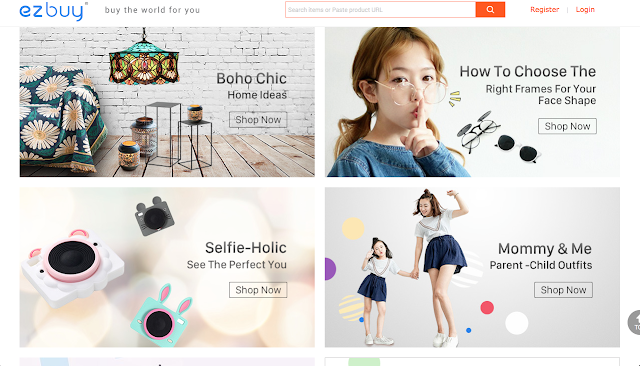 Ezbuy provides professional online shopping services, from China, Taiwan, and USA making it accessible to countries like Singapore, Malaysia, Australia and Thailand to shop with convenience. 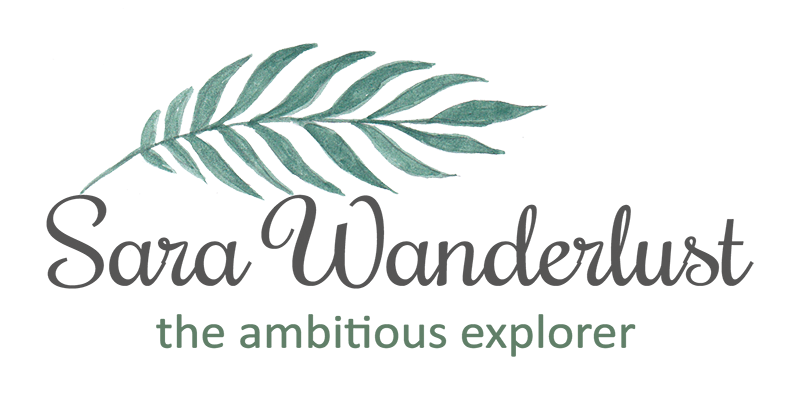 The site is filled with a variety of options, ranging from womens clothing, mens clothing, toys, shoes, bag, accessories, home and garden, beauty and health, sports and outdoors, office and stationery, automotive, mobile and tables and more! They also have daily flash deals, making it perfect for shopaholics to find more reasons to shop. 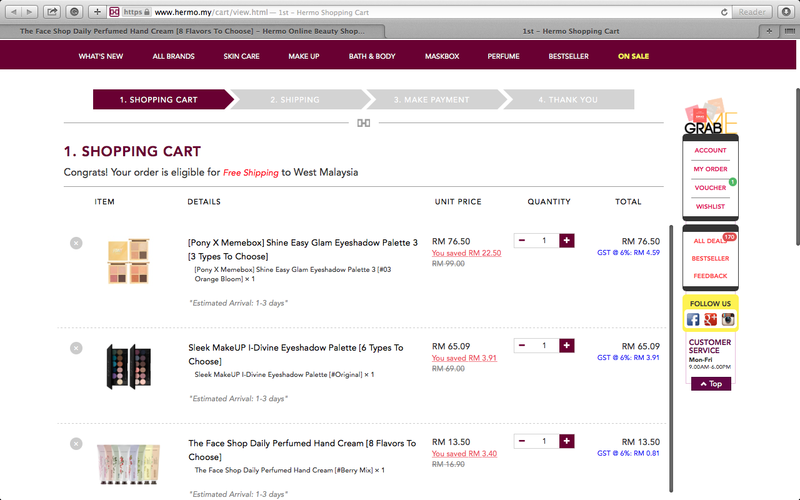 Personally, the only thing thats usually stops me when shopping online is the shipping fee. And if you get me, it can be CRAY especially when the items are coming over by air. *SOBS* But guess what? With ezbuy, they have a solution! One thing that i have to admire about ezbuy.my is that they have this ezbuy Prime membership program which lets you ship everything at only RM8.80 nett, with unlimited parcel weight and size. How crazy is that?! 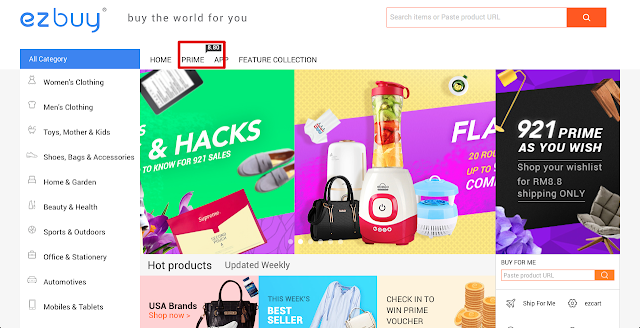 ezbuy prime is a subscribed membership program exclusive to ezbuy existing customers, where you need to pay RM188 to enjoy unlimited international shipping for a year, where there is no limit on how many items you buy at one time, you can only pay RM8.80 shipping fee per checkout. And that is CHEAP! The program is known to be the lowest agent fee rate, and it also provides free insurance up to RM2000 per parcel to cover unfortunate incidents like loss, damage and issues. Rest assured, you'll have less things to worry about when it comes to making sure that your parcel arriving safely. To take advantage of the membership, all you need to do is pick a product that you like, and check whether if its eligible for prime shipping which will be available below the 'add to cart' button. 1 | 15% off shipping fee with code, and all you need to do is enter the coupon code 'ezfriend15'. As a verdict, i have to say that im already eyeing on a few things that i would like to purchase. Home deco and furniture on ezbuy are way too cheap to resist. And with the Prime membership being available for subscription, i might need to be more concern on my bank account. lol. 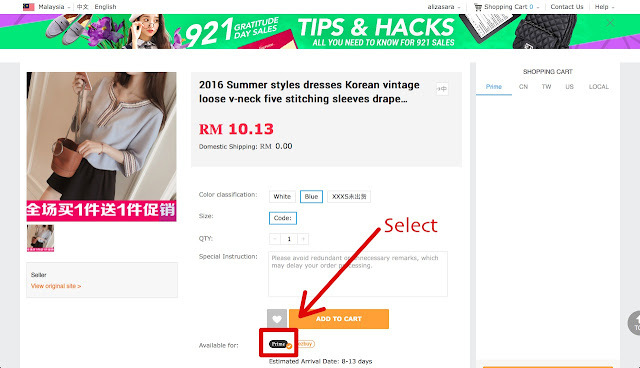 I have to admit that shopping the world has never been so convenient, thanks to ezbuy for making it possible. So thats about it! Why not check out ezbuy.my when you have the time by heading over to think link, here. Marathon enthusiast, time to step up your game cause i present to you 'Run For Your Lives'. Its a game of flag tag set in the world of a zombie apocalypse, making a return to Malaysia this December 31st 2016 at Taman Botani Putrajaya. The marathons concept began in the US back in 2011 and has sucessfully attracted participants from all around the world, making it possible for them to spread to other cities which includes Bangkok, Singapore and Hong Kong. 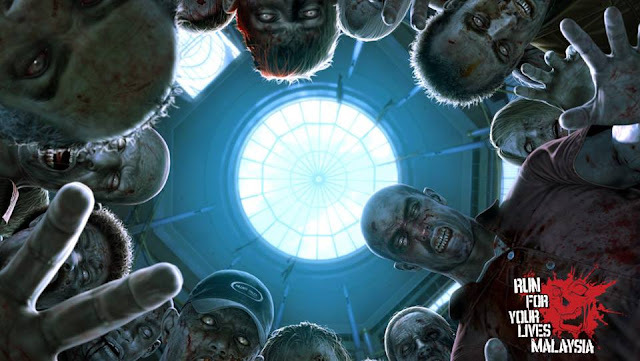 The idea of the run is out of the ordinary where runners of the marathon will experience a zombie apocalypse, taking over the world caused by an unknown virus. 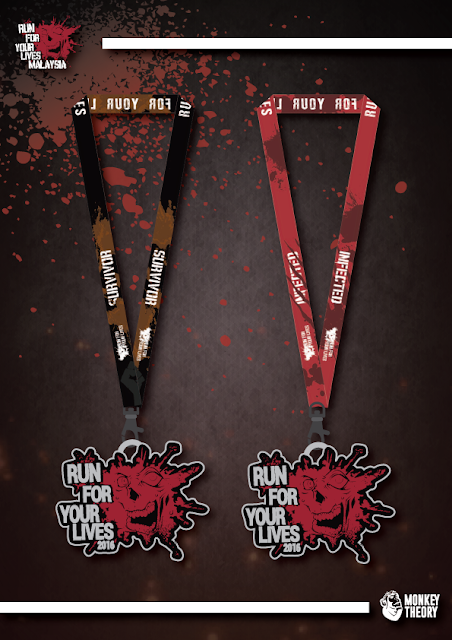 Participants may choose to run as a survivor (human) or as a zombie. If youre up for the gameplay, the idea of the run is basically that humans will have to outrun the zombies before they catch the humans. Trilling no? To reach the safe zone, it definitely wont be easy. 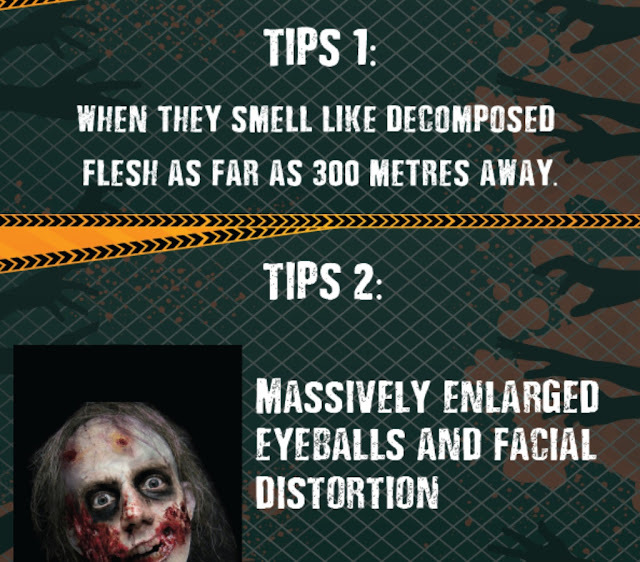 Other than zombies, there will be various obstacles to overcome and there will be three story modes to enhance the zombie apocalype experience. With the works of technology and gamifiation, Run For Your Lifes works towards its goal of making exercise fun, helping participants encounter a new experience while reaping the joys and benefits of getting active. So what are you waiting for? Early bird registration can be done on http://secure.monkeytheory.asia/event/Run-For-Your-Lives-Malaysia from Saturday, October 1st while payments can be made via credit/debit card and online banking. 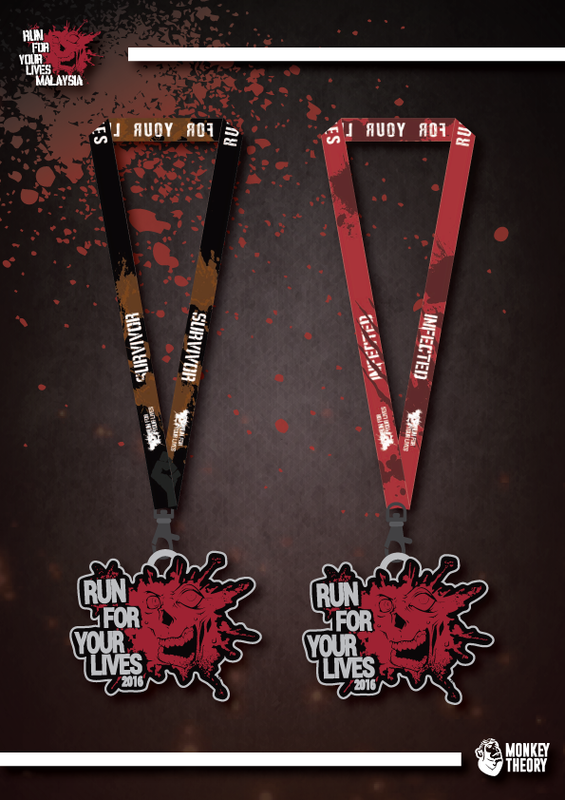 So once you've registered, participants will be given a choice to run as a Survivor or a Zombie, which provides different entitlements. Hey guys, I'm here writing to share with you about my shopping experience on Hermo via Molpay Cash! 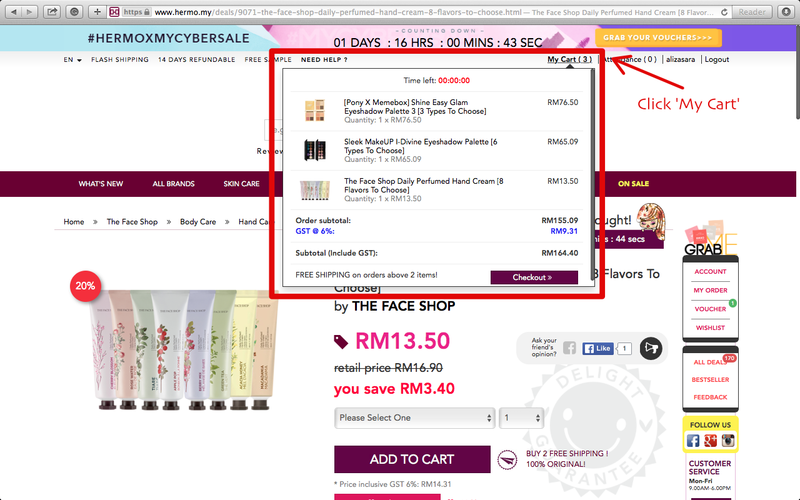 We all know that Hermo is one of the biggest beauty sites in Malaysia that sells all your beauty needs in a click of a button. And whats even better? They now have MolPay Cash as a payment option, which makes it super convenient to shop when it comes to making payment. What does this mean? It means that if you have no credit/visa card, NO PROBLEM, just opt to pay via Molpay Cash for a quick and hassle free payment method. So if youre unfamiliar with Molpay cash, well let me tell you a thing or two about Molpay Cash. Molpay Cash is basically is a payment option for those who are concern with safety or unable to pay by card. And with MolPay Cash, it enables you to pay to a secured store and reports your payment instantly once payment has been made. If they had this system during my student days, i would be the happiest girl with all the beauty products i need. (Because back then, i didn't exactly have a card nor trusted payment via deposit machine to secure the payment). Once you're happy with your selected items, hover to the top right will have a tab 'My Cart' and it will show you a summary of your selected items that you are purchasing. Easy no? 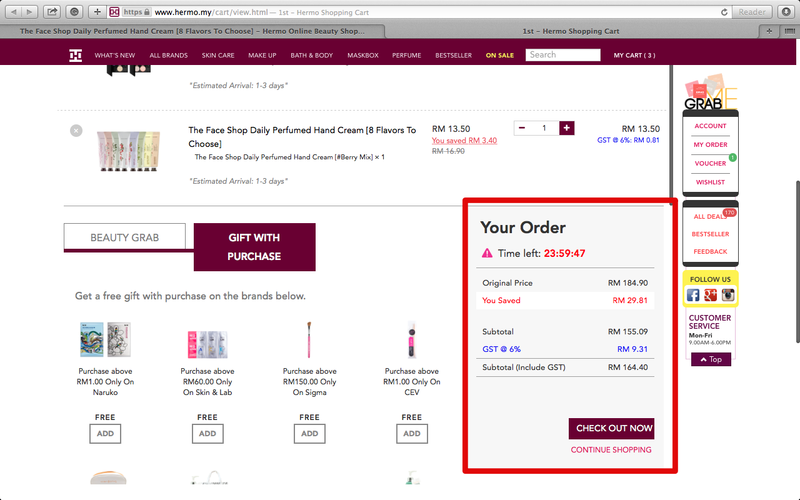 Click check out, and it will lead you to a new page of a summary of your purchases for double confirmation with the total amount to be paid at the bottom of the page. Once you have no second thoughts of purchasing more items, click 'Check out Now'. Now for the important part! How do i get to the Molpay Cash payment selection? 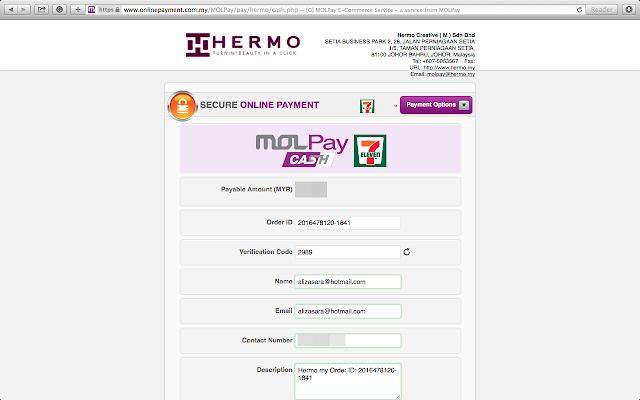 Hermo may require you to select a payment option but fret not if you don't see the word Molpay Cash! 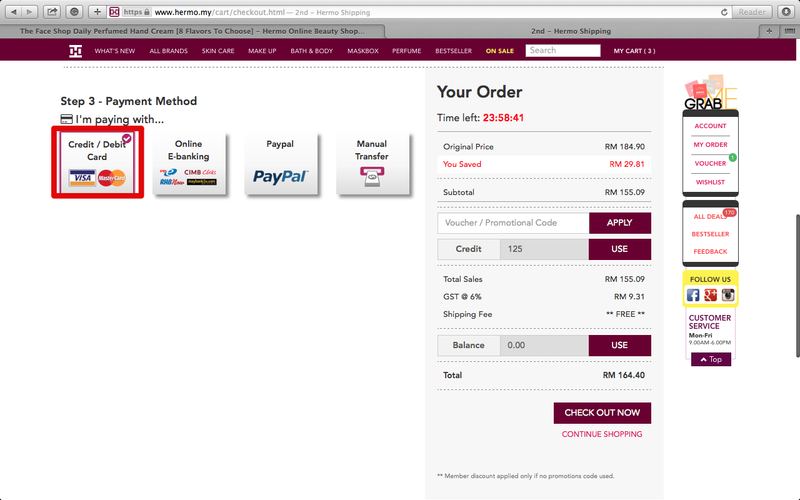 What i did was that i selected the credit/debit payment option, and it lead me to another secure online payment page. On the Secured payment page, click the payment options, then select 7Eleven. 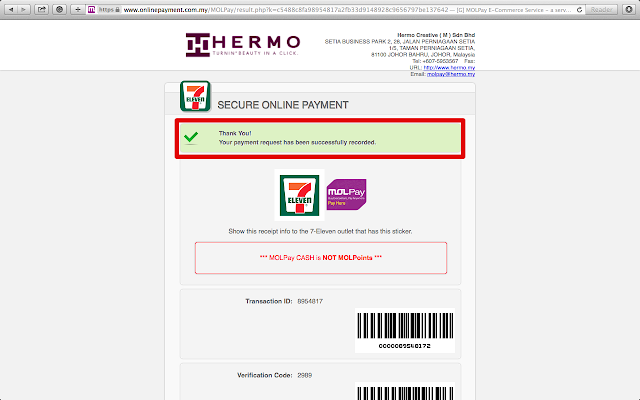 Once selecting the 7Eleven payment option, it will then change your payment option and be sure that you see the molpay cash and 7Eleven logo (refer to above) to be sure that you've selected the right payment option. 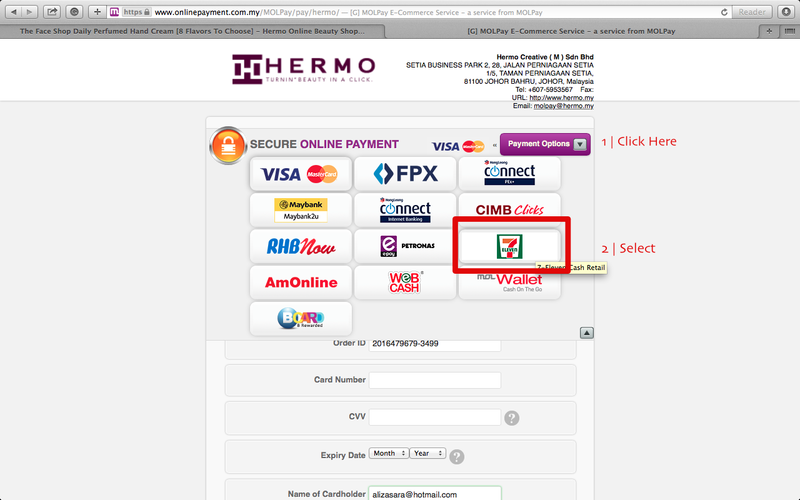 If you're satisfied with the total amount payable, click 'proceed' and it will confirm your payment option and record it to Hermo's database. A bar code and reference number is then generated for you to proceed with payment. Now for the fun part! You will also receive an email stating your cash payment receipt to be paid. In my case, i didnt exactly have time to print it out, so i went hunting for a 7Eleven that provides the Molpay Cash service and just showed my email to the cashier. BE VERY SURE that the 7Eleven that youre heading to has the MolPay Cash logo to avoid disappointments as not all 7Elevens have this service apparently. I personally had to go to THREE 7Eleven's to get my payment done as some did not have the service, and the other one told me that the system was down. 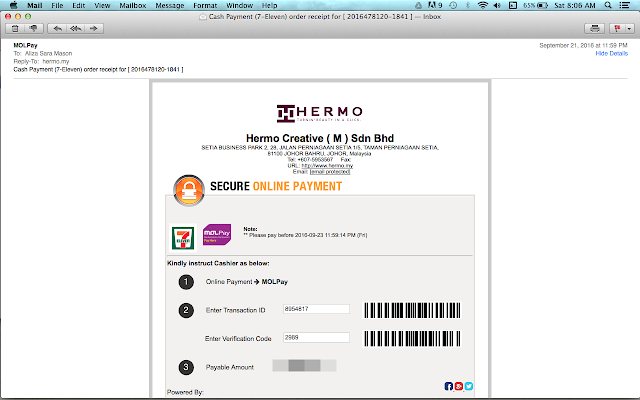 But not to worry, Hermo gave me 48 hours to complete my payment so i had enough time to stop by 7Eleven to make payment. And once you've made your way to 7Eleven and made your payment, 7 Eleven will issue you a MOL-MOLPAY receipt and a 7Eleven Receipt. So do expect to get 2 receipts to confirm that you've made payment. 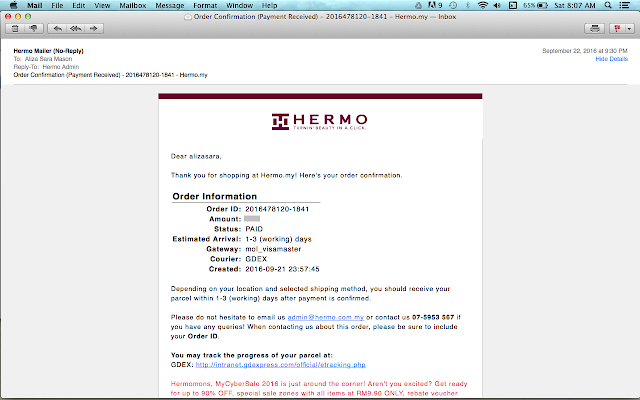 I was actually amazed that just after making my payment, i received an email stating that my payment has been approved by Hermo! YAY! (Refer to receipt time 9:30pm and email received time 9:30pm). I have to say that i feel safer paying this way knowing that my payment has been electronically received and guaranteed by Hermo instantly. And youre DONE! Sit back, relax and wait for your parcel to arrive. Its that simple! And its amazing how fast this parcel arrives. I completed my payment on a Thursday night, and got my parcel sent over to my door step on a Saturday morning. 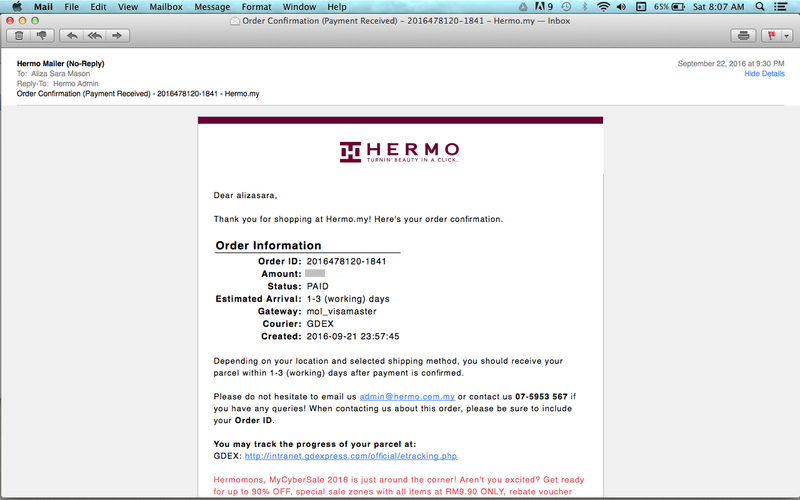 That really made my day, so thank you Hermo for getting my parcel ready in such a short time! For live updates, follow me on Instagram at @alizasara to keep up with me. As a summary of my experience, i have to say that its great to know that MolPay Cash exist! It saves me the worry of using my card details, and also suitable for those who prefer making cash payments instead of cards purchases. Super easy, convenient and hassle free if you ask me!